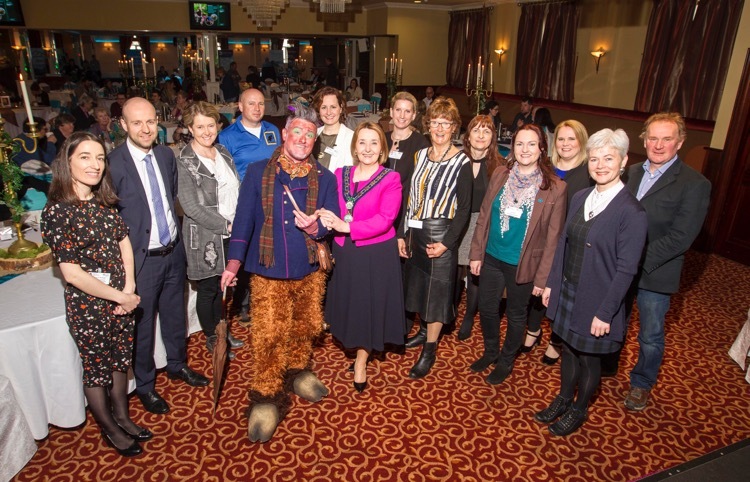 Newry, Mourne and Down District Council yesterday welcomed key players in the tourism sector to share expertise at an Industry Day in the Canal Court Hotel & Spa. The event, which included a discussion of local and national tourism, was organised to help maximise the tourism potential as the Council develops its EPIC Experiences to become the premier, year round destination in Ireland. Speaking at the Industry Day, Newry, Mourne and Down District Council Chairperson, Councillor Roisin Mulgrew, welcomed the delegates to the event, which was designed to provide key insights into the way the industry can increase business by using the district’s ‘Mountains, Myths and Maritime’, to promote its EPIC Experiences to a growing market. Chairperson, Councillor Roisin Mulgrew with speakers at Newry, Mourne and Down District Council’s Mountains, Myths and Maritime Industry Day. Councillor Mulgrew said, “Growing tourism is the key priority of the Council’s Corporate Plan. The launch of the Council’s Tourism Strategy last year outlined how Newry, Mourne and Down would deliver the EPIC challenge of becoming the premier destination on the Island of Ireland. Rosemarie McHugh, Tourism Northern Ireland summarised how the outlook for tourism in Northern Ireland generally is good, particularly in relation to the Republic of Ireland market, which has demonstrated a significant upturn in performance. The Industry Day also provided an opportunity for local tourism businesses to hear from Carol Gleeson at the Burren Geopark, on how businesses could benefit from a Geopark. This session was particularly important, as Newry, Mourne and Down District Council has identified UNESCO Geopark Status as a key priority and has just commenced a detailed consultation programme to determine the views of local business, industry and the wider community on becoming a Geopark. The morning session concluded with an interactive session facilitated by Kate Taylor from Taylored Training, and a panel of experts from across the island of Ireland on developing visitor experiences. The panel included Caroline McErlean from The Cuan; Bren Whelan from Donegal Climbing and Tina O’Dwyer from The Tourism Space. The afternoon sessions focused on local guides and heard from Ann Ward and Venora O’Brien, Ring of Gullion Ambassadors, who shared their experience in promoting holistic recreation in the outdoors, and David Maginn on a succession plan to self-catering holiday cottages. An interactive session was held with local tour guides and Judith Boyle on the support required to develop and market their business. At the end of the day’s proceedings, recently trained Ambassadors from the Ring of Gullion Landscape Partnership were presented their certificates from Des Murphy, Chairman of the Landscape Partnership.